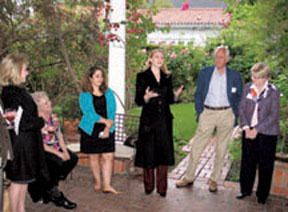 FIRST LADY, Amy Elaine Wakefield, and Garden Tour preview party guests, left to right: Sharon Keyser of Paramount Pictures; chair Suz Landay; Mary Hodge, executive director of the Getty House Foundation; Wakefield; Peter Landay; and Windsor-Square-Hancock Park Historical Society treasurer Fluff McLean. FIRST LADY Amy Elaine Wakefield. Visit six private gardens in historic Windsor Square on Sun., May 1 from 2 to 6 p.m. during “Living Alfresco,” the Windsor Square-Hancock Park Historical Society’s 11th annual Los Angeles Garden Tour & Party. First Lady of Los Angeles Amy Elaine Wakeland is the honoree at the event. Paramount Pictures and CIM Group are sponsors and Coldwell Banker offers support, says event chair Suz Landay. Gardens at Getty House, official residence of the mayor, will be on the tour along with other backyards on Irving Blvd. Beneficiary will be the Wilshire Division, LAPD. “We will be sprucing up the station on Venice Blvd. We are pleased to offer this to the station for the neighborhood,” said Landay. Tickets are $60 and $100 for couples. Students are $50. Tickets can be purchased the day of the event at the Getty House, 605 S. Irving Blvd. Go to wshphs.org.